Draft: 2013, Baltimore Orioles, 27th rd. Signed by Orioles scout Tom Dreier...Attended Texas State University...Has a twin sister, Donna. Earned his first Major League win on 4/7 vs. NYY...Did not allow a run in April, tossing 12 consecutive scoreless appearances to begin the season (7.2 IP)...In 14 appearances from 6/6-7/28, posted a 0.57 ERA (1 ER/15.2 IP)...Posted a 3.09 ERA (8 ER/23.1 IP) in 27 home games and opponents hit .267 (24-for-90) at Oriole Park...Stranded 22-of-29 inherited runners...Went 1-0 with a 2.35 ERA (4 ER/15.1 IP) in 13 games with Triple-A Norfolk. Named the Jim Palmer Minor League Pitcher of the Year and was an Eastern League mid-season All-Star with Double-A Bowie...Had his contract selected by the Orioles on 7/15...Made his Major League debut on 7/17 at TB, tossed 0.2 innings and struck out Kevin Kiermaier for his frst Major League strikeout... Tossed 15.1 innings to start his Major League career before allowing his frst run, a home run to Hanley Ramirez on 9/22 vs. BOS...Held lefties to a .132 (5-for-38) batting average while with the Orioles... Did not allow a hit in 13 of his 22 Major League appearances • With Bowie, worked in a career-high 40 games...His innings pitched (46.1) and strikeouts (50) were both career highs... Worked at least 1.0 inning in 35 of his 40 appearances...With Bowie, held lefties to a .188 (13-for-69) batting average... Led the Baysox in WHIP (1.04) and K/BB ratio (7.14), was second in appearances, and third in saves (four)... Struck out a season-high four batters in his frst appearance of the season on 4/8 vs. Akron...Compiled his lowest monthly ERA in the month of April, going 1-0 with a 1.04 ERA (1 ER/8.2 IP). 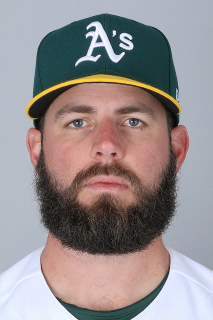 April 4, 2019 Milwaukee Brewers claimed LHP Donnie Hart off waivers from Oklahoma City Dodgers. April 4, 2019 Milwaukee Brewers optioned LHP Donnie Hart to San Antonio Missions. March 10, 2019 Los Angeles Dodgers optioned LHP Donnie Hart to Oklahoma City Dodgers. March 7, 2019 Los Angeles Dodgers claimed Donnie Hart off waivers from Baltimore Orioles. March 1, 2019 Baltimore Orioles designated LHP Donnie Hart for assignment. September 14, 2018 Baltimore Orioles recalled LHP Donnie Hart from Norfolk Tides. August 11, 2018 Baltimore Orioles optioned LHP Donnie Hart to Norfolk Tides. August 1, 2018 Baltimore Orioles recalled Donnie Hart from Norfolk Tides. July 22, 2018 Baltimore Orioles optioned LHP Donnie Hart to Norfolk Tides. July 10, 2018 Baltimore Orioles recalled Donnie Hart from Norfolk Tides. June 28, 2018 Baltimore Orioles optioned LHP Donnie Hart to Norfolk Tides. June 26, 2018 Baltimore Orioles recalled Donnie Hart from Norfolk Tides. June 25, 2018 Baltimore Orioles optioned LHP Donnie Hart to Norfolk Tides. June 23, 2018 Baltimore Orioles recalled Donnie Hart from Norfolk Tides. June 13, 2018 Baltimore Orioles optioned LHP Donnie Hart to Norfolk Tides. June 12, 2018 Baltimore Orioles recalled Donnie Hart from Norfolk Tides. June 1, 2018 Baltimore Orioles optioned LHP Donnie Hart to Norfolk Tides. May 30, 2018 Baltimore Orioles recalled Donnie Hart from Norfolk Tides. May 20, 2018 Baltimore Orioles optioned LHP Donnie Hart to Norfolk Tides. May 13, 2018 Baltimore Orioles recalled Donnie Hart from Norfolk Tides. April 15, 2018 Baltimore Orioles optioned LHP Donnie Hart to Norfolk Tides. April 13, 2018 Baltimore Orioles recalled Donnie Hart from Norfolk Tides. March 18, 2018 Baltimore Orioles optioned LHP Donnie Hart to Norfolk Tides. September 2, 2017 Baltimore Orioles recalled Donnie Hart from Norfolk Tides. August 29, 2017 Baltimore Orioles optioned LHP Donnie Hart to Norfolk Tides. August 28, 2017 Baltimore Orioles recalled Donnie Hart from Norfolk Tides. August 9, 2017 Baltimore Orioles optioned LHP Donnie Hart to Norfolk Tides. June 20, 2017 Baltimore Orioles recalled Donnie Hart from Norfolk Tides. June 7, 2017 Baltimore Orioles optioned LHP Donnie Hart to Norfolk Tides. May 27, 2017 Baltimore Orioles recalled Donnie Hart from Norfolk Tides. May 17, 2017 Baltimore Orioles optioned LHP Donnie Hart to Norfolk Tides. August 12, 2016 Baltimore Orioles recalled Donnie Hart from Bowie Baysox. July 24, 2016 Baltimore Orioles optioned LHP Donnie Hart to Bowie Baysox. July 15, 2016 Baltimore Orioles selected the contract of Donnie Hart from Bowie Baysox. March 2, 2016 LHP Donnie Hart assigned to Baltimore Orioles. September 3, 2015 LHP Donnie Hart assigned to Bowie Baysox from Frederick Keys. June 16, 2015 LHP Donnie Hart assigned to Frederick Keys from Delmarva Shorebirds. March 16, 2015 LHP Donnie Hart assigned to Baltimore Orioles. June 10, 2014 LHP Donnie Hart assigned to Delmarva Shorebirds from Aberdeen IronBirds. June 28, 2013 LHP Donnie Hart assigned to Aberdeen IronBirds. June 25, 2013 LHP Donnie Hart assigned to Aberdeen IronBirds. June 19, 2013 Baltimore Orioles signed LHP Donnie Hart.